The arrival of the Slavs in the Balkans marked the process of integration of the inter-Balkan substratum with the Slavs. Lidija Slaveska suggests that the synthesis of the material, cultural and spiritual values of natives and conquerors is an inevitable process and lasts for many centuries. In Balkans, she suggests that the beginnings of their cohabitation is an additional factor in ascertaining that Slavic tribes did not settle in a deserted and empty territory. Rather, by coming into contact with an entirely new culture, with people who spoke differently and whose way of thinking was different from theirs, the intermingling of two different civilizations and cultures was inevitable. Direct contact resulted in the interweaving of two heritages: the old Balkan cultural and mythical heritage with the new Slavic culture and mythos. Historical, archaeological and linguistic studies indicate that following the settlement of the Slavs on Balkan territories their cultural heritage integrated with the cultural heritage of the natives. In the metropolis of Saint Erazmo near Ohrid, skeletons have been discovered which can be divided into two groups: the older skeletons belong to people who had lived in the 7th and 8th century, while the younger ones to people from the 9th and 10th century. M. Shtefanchich ascertained that the skeletons differ in demographic and anthropological representation. Byzantine documents provide information about the siege of Salonica by the Avaro-Slavs in 586: "If one would imagine that all Macedonians, Thracians and Achaeans gathered in Salonica at that time, all of them together would not represent even a small part of that barbarian multitude which then besieged the town." There it is indicated that the Macedonians and the Slavs took part in the siege of Salonica as members of two opposed parties. However, there is written record which states that during the invasion of Crete by Nichephorus Phocas in 961, the Byzantine emperor "gathered ships and selected infantry of Thracians, Macedonians and Sclavenians". This fact is evidence that, by living together on the same territory, the cohabitation of the ancient Macedonians and the immigrant Slavs had become part of a historical process characterized by the blending of two or more ethnoses on these territories. Few ancient towns survived the invasion of the Slavs, particularly in Macedonia, and few of them preserved their old names. However, "traditions about the vanished ancient settlements were preserved. They were recorded, among other matters, by the ecclesiastical administration, where new bishoprics appeared as successors to the former ones." The evidence of archeological finds throughout Macedonia supplement the noticeable absence of written information about the gradual interweaving of the spiritual and material heritage of the native Macedonians with that brought by the conquering Slavic tribes. Blaga Aleksova's research in eastern Macedonia reveals the traces of both cultures: the Slavs adopted the monuments of the natives, and hence along the Bregalnica River and in the vicinity of Demir Kapija the newcomers built their own churches on the foundations of Macedonian temples, giving at the same time purely Slavic characteristics to the building material: the engraving of signs with the Slavic alphabets and characteristically Slavic enigmatic lines and strokes. The Slavo-Macedonians adopted the ancient cultural heritage to an extent suitable for them as conquerors of the territory where the Ancient Macedonians had lived, establishing their right to this heritage through the assimilation of the of the two peoples. Hence the opinion that in building a historical consciousness of the Macedonian people there is mutual participation of two traditions: the Classical traditions of the ancient inhabitants of Macedonia, and the traditions of the conquering Slavs. The collective memory can also be of use in drawing certain conclusions about the role of oral traditions attached to historical figures and historical events. In a number of cases, many peoples have based their consciousness of belonging to a strictly defined ethnos upon such an attachment to the past, drawing a long and continued line from "that of the old times" to "this at present". Macedonian folk tradition vividly cherished and preserved the mystified memory of their ancestors in the people's memory. These memories were closely attached to medieval culture, but at the same time incorporated new elements and symbols under the influence of contemporary historiography. Along with the beginnings of modern South Slavic historical thought "the process of forming the ethno-cultural Macedonian zone was ongoing". Ante Popovski, commenting on the arrival of the Slavs in the Balkans and their contacts with the culture of the Ancient Macedonians, writes: "Thus, the Ancient Macedonians, through the entire 3rd century A.D. and until their assimilation into another ethnos, did not part either with their own name, or the name of their famous Macedonian homeland. Soon after that, the Slavic colonization of Macedonia began. It means that an act of grandiose historical meeting of two ethnoses was accomplished: the Macedonian Classical ethnos, which by intermingling with the Slavic ethnos was disappearing from history as an independent and autogenetic ethnos; and the Slavic ethnos which inherited both its lands and fame and which, by unavoidable and undeniable natural law, inherited the blood and the desires of the ancient Macedonians in many respects. Therefore, that meeting remains one of the most important events in the long history of the Balkans. The Slavs who settled there and the Ancient Macedonians who surrendered their land to them through storms and blood accomplished an epic fusion, which continues to be referred to as Macedonian throughout history." "If I come back to my position, I'll take no more care about the peace. 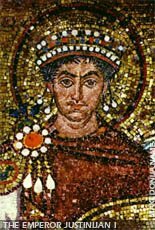 And really he'll wont leave any place, land or sea, untouched by a war, that he will lead and also he will kill all the Byzantiums"
He shared the destiny of his preliminary, the comes Hacon (read Hatson), who in 616, united in the First Great Union, the Macedonian Slavs (the Dragovites, Sagidates, Velegezites, Rinhines, Berzites...). Concerning the use of the term Macedonia in the early 9th century, the letter sent by Byzantine Emperor Michail 2nd (reigned 820-829) to Louis le Debonnaire on April 10th, 824 is intriguing. Michail wrote of the 821-824 rebellion of Thomas the Slav: "Thomas... by taking our ships and boats, had the possibility to come into (some) parts of Thrace and Macedonia. In such a quick action, he besieged our town (Constantinople) and surrounded it with the fleet in the month of December, Indiction 15 (December, 821)." Furthermore, in his letter to the Emperor of the Holy Roman Empire, Michail writes that among the rebels, Thomas had people from the "areas in Asia, Europe, Thrace, Macedonia, Thessaly and from the surrounding sclavenes". Apparently, Michail 2nd in referring to Macedonia in the first case meant the theme Macedonia, and in the second case as a geographical and historical entity. By the expression "the surrounding sclavenes", he meant the Slavs, Macedonian Slavs foremost. Comenyat, author of On the Takeover of Salonica (by the Arabs in 904) gives a number of details about the Macedonian Slavs, mentioning also the Dragovites, Sagudats, Strymians and others who as compact Slavic populations lived near Salonica (Solun). Comenyat writes: "Our homeland, my friend, is Salonica and, first of all, I am going to introduce that town to you... the great and first town of the Macedonians..."
It appears as if the main goal of the penetration of the Slavic tribes to the south was Salonica. "And they (the Slavs) stated that they came to besiege and conquer Salonica and the surrounding towns. When the emperor heard this, he grew upset and wrote to German immediately to postpone his journey to Italy and to help Salonica and the other towns", writes Procopius Kesariski, in mentioning Macedonia in his History of the Wars. "In the field by the holy temple, a man saw a not very numerous barbarian army (as we counted them together up to five thousands), but very strong, as it consisted of selected experienced fighters... and until late in the night they fought, and the people of the victor (the protectors of Salonica) exposed themselves to great risk while they attacked and retreated, because as said, they had the selected flowers of the entire Slavic people for their opponents. Finally, when help arrived, the Barbarians were expelled and they retreated." On July 25th, 877, the invaders made a decisive attack: they assaulted the town ramparts for three days, but did not succeed in storming them. 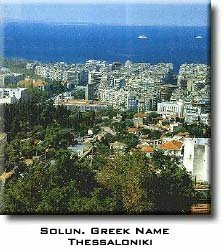 The invaders were the Slavs who lived in the vicinity of Salonica, as stated by Byzantine sources; by the middle of the 9th century "all the Salonica people spoke pure Slavic and soon the city got it's Slavic name Solun", according to the same sources. "They did not know anything about Christ's name; they served the Scythian insanity, believed in the Sun, the Moon, as well as other stars, while some of them even made sacrifices to dogs... They closed their eyes and ears not to see and hear when conquered Christians... in conversations with them mentioned Christ's teaching..."
Christianity destroyed and accelerated the disintegration of the clan social system. Princes more often took over elements of state authority and the number of the armed people in their Sclavinae constantly increased under feudalism. The 8th century in Macedonia was a century when the formation of the Macedonian people accelerated, the name of Macedonia and Macedonians became increasingly dominant and when Macedonia could be spoken of as a precisely defined territory and individual people. Branko Panov states that from the 6th to 11th century the Macedonian Sclavinae remained outside the Byzantine Empire, most of them being independent principalities with their own princes. From the 8th century onwards, a number of sources confirm that the Macedonian Sclavinii were in fact already assuming the shape of states with well-trained and relatively well-equipped armies, particularly in heavy infantry. The Sclavinii were capable of resisting Byzantine attacks, and their governors were able, with the help of the army, to subordinate the people who inhabited these clan and tribal communities. All these Sclavinae made up a common linguistic territory, where the Slavonic language was common; clear evidence that on the territory of the Ancient Macedonian state there existed all the elements required for the Macedonian Slavs to be considered a nation. The consciousness of ethnic and state individuality was so strong that, even when Macedonia fell under Bulgarian and Byzantine authority, it was preserved by the Macedonians and was manifested in various ways: they maintained self-government and continued to elect their own princes, continued to use Slavonic speech and practiced their own customs.